I've had a lot of espresso shots on my travels - from stand up espresso bars on the streets of Rome that have remained unchanged for decades, to pop up coffee bars started by a new generation of enthusiastic young baristas. There have been some very good espresso shots, some just about average shots, and occasionally shots that were so bad that I couldn't even finish them. The shot below falls into the third category. 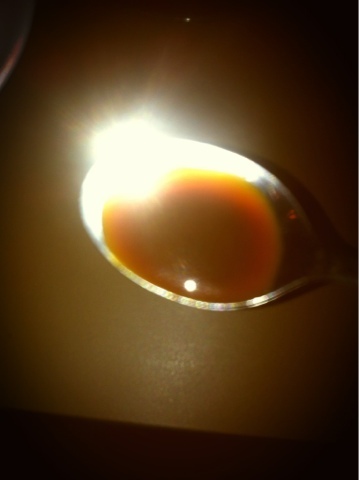 This was supposed to be a single espresso, however this is clearly an over extracted shot, where the volume of liquid is closer to that of a double espresso. This will certainly have an impact on the quality of the shot, as a continued extraction will result in unpleasant flavours. This was certainly the case - my first impression was of a very unusual aftertaste, which reminded me of styrofoam or rubber. We're not off to a great start with this one. 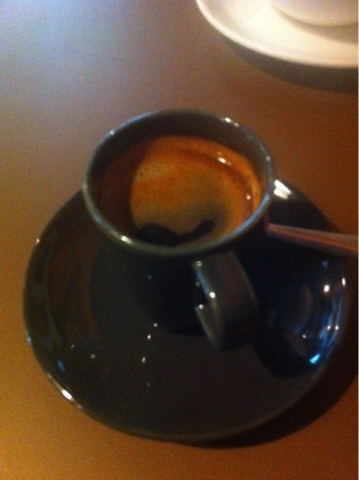 After the crema had dissipated, I noticed a sheen of oil droplets coating the shot. There was also a smell of frying permeating the cafe where this was served. What may have happened is that the extraction system in use in the cafe is inadequate, and that the aerosolised droplets of oil have coated the coffee cups. When a shot is pulled, the cooking oil floats on top of the liquid, infusing flavour into the coffee, and not in a good way. This was also apparent in the cafe's milk based drinks - there was an unusual aftertaste of butter, which is something that I don't particularly want to experience again. Something was still not quite right however. Even by looking at the shot, I could see that something was still wrong. An espresso shot in a quality coffee will contain black liquid, but one which is also quite clear - there should be nothing floating in it. The shot below was a murky brown colour, and contained a significant amount of very fine coffee particles. It's obvious in the picture below - the darker portion at the centre of the spoon contains the particles in question. This suggests that the grinder settings are incorrect, and are producing too fine a grind for espresso shots. The machines themselves are not at fault - both the grinder and espresso machine themselves were commercial grade - but they way in which they are being used is incorrect. It's interesting to note that very finely ground coffee and an over extracted shot should be two mutually exclusive events. It's much, much easier to over extract a shot when the grind size is too coarse, and steam can pass through the ground coffee much more easily. A fine grind should offer more resistance, slowing the passage of steam through the coffee in the portafilter, and reducing the volume of liquid in the shot. So what happened? The barista seemed uncertain when I ordered a single shot, and my have served a double shot instead. Alternatively (and I suspect that this is what happened) the shot may have been topped up with hot water, to avoid the appearance of short changing the customer by serving a half full cup - I noticed a significant amount of steam rising from the shot when it was served, and a break in the crema where hot water would have been poured in. I don't normally see steam rising from espresso shots, and certainly not in the quantity that I saw here. If this is what happened, then it speaks volumes about the cafe's approach to producing quality coffee, and of the level of coffee knowledge amongst the staff. A good friend produces quality shots in his apartment in Tampines with a simple hand grinder and a MyPressi twist - the shots that he has produced have consistently been of a much, much higher quality than the shot above, which was made with professional equipment. Why is this? He genuinely loves coffee, and has a very good understanding of coffee fundamentals - for example, how grind size and extraction times matter, and are inversely proportional to the quality of shots that are produced as a result. Also, and this may seem like the most minor and trivial point to take issue with, I automatically deduct points when I see "expresso" on a menu. It's espresso. If you want to compete as a quality coffee place, show me that you understand the underlying product. Together with the issues above, it suggests that the level of coffee knowledge is sadly lacking, something that no amount of attempts at latte art will make up for. As for the cappuccino (wouldn't be a complete post without an espresso and a cappuccino)...well, it's basically warm caffeinated milk, with absolutely no coffee character whatsoever, and with a powdery texture that remains in your mouth, due to the incorrect grind settings described above. I like to give cafe's a chance to improve, and not to give them a bad review after only one visit. However, the problems above are fundamental, and I don't plan on coming back for more.